Edition Statement 3rd Revised, Updated ed. "Bruce Hyman and Cherry Pedrick's updated and expanded version of their classic, The OCD Workbook, is one of the best self-help books on OCD. Many sections have been expanded and new ones added. Readers will find up-to-date information on their own particular OCD concerns and how to conquer them." --Bruce Mansbridge, Ph.D., author of The Complete Idiot's Guide to Conquering Obsessive-Compulsive Behavior and clinical assistant professor of psychology at the University of Texas, Austin "While there are many self-help books for OCD sufferers, there are few that are of the same caliber, in terms of completeness and usefulness, as Hyman and Pedrick's The OCD Workbook. This is a first-rate resource for those seeking to recover their lives from this torturous disorder." --Fred Penzel, Ph.D., licensed psychologist and executive director of Western Suffolk Psychological Services in Huntington, NY, and author of Obsessive-Compulsive Disorders "More than just a workbook, this work by Hyman and Pedrick defines and demystifies obsessive-compulsive disorder. In addition, it offers therapists and patients a highly specific and useful treatment program. The OCD Workbook should be an important addition to your collection of OCD treatment literature." --Robert H. Ackerman, MSW, clinical assistant professor in the Department of Psychiatry at the State University of New York, Health Science Center at Brooklyn "There has long been a need for a workbook that puts concrete instructions for doing therapy directly into the hands of people with OCD and their families. Hyman and Pedrick have admirably filled that need in this book. The OCD Workbook provides critically important practical information on how to overcome a wide variety of OCD symptoms." --Jeffrey M. Schwartz, MD, research professor of psychology at the University of California, Los Angeles, and author of Brain Lock and The Mind and the Brain "This is an excellently organized, self-directed program to assist sufferers of OCD. The examples of cognitive behavioral treatment components for adults and children with OCD are very comprehensive. Parents and family will find support and assistance in breaking the patterns of enabling, and therapists will be able to implement behavioral assignments that will decrease OCD suffering." --Blanche Freund, adjunct professor of psychology and psychiatry at the University of Miami School of Medicine "This book is an extremely helpful step-by-step guide to overcoming OCD. The authors are experienced in the treatment of this debilitating disorder and provide an easy formula for understanding and treating the symptoms of OCD and some spectrum disorders, such as health anxiety and body dysmorphic disorder. It is a very thorough book explaining the need to engage in therapy and how to apply specific strategies for specific symptoms. Some helpful hints are also provided for family members. I strongly recommend the book for those combating OCD." --Fugen Neziroglu, Ph.D., board-certified behavior and cognitive therapist, director of the Bio-Behavioral Institute in Great Neck, NY, and author of Body Dysmorphic Disorder "The third edition of The OCD Workbook expands on the already comprehensive second edition by adding new insights in areas including mindfulness meditation, responsibility modification techniques, and acceptance and commitment therapy. Here the reader finds the most comprehensive survey of cognitive behavioral treatment for OCD that is accessible to the layman. All is clearly written, easily grasped, and laid out in a very user-friendly manner. 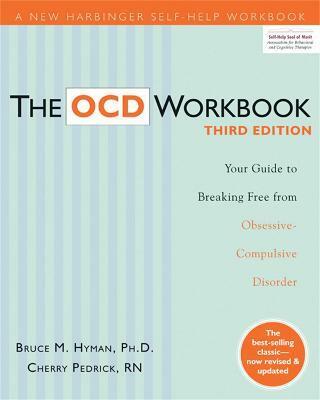 Every OCD sufferer should read this book!" --Ian Osborn, MD, psychiatrist, assistant professor of psychiatry at the University of New Mexico Health Science Center, and author of Tormenting Thoughts and Secret Rituals: The Hidden Epidemic of Obsessive-Compulsive Disorder "A wealth of information and real help for people with OCD and their families! The OCD Workbook is a great resource that is practical and easy to understand, with the latest updates and effective step-by-step strategies." --Aureen Pinto Wagner, Ph.D., author of Up and Down the Worry Hill: A Children's Book About OCD, What to Do When Your Child Has OCD, and Treatment of OCD in Children and Adolescents "This book is exceptional in that it has practical benefits for both obsessive-compulsive disorder (OCD) sufferers and for clinicians. For sufferers, it serves as a self-help treatment guide for understanding the disorder and using proven treatment techniques to bring about symptom reduction. For clinicians, it serves as a treatment manual that can assist in making the initial diagnosis, identifying the particular OCD subtype, and developing a successful treatment plan." --Paul R. Munford, Ph.D., director of the intensive outpatient treatment program at the Cognitive Behavior Therapy Center for OCD and Anxiety in San Rafael, CA, author of Overcoming Compulsive Washing "This book offers a clear explanation of the modern treatment of OCD. I personally expect to recommend it to many of my OCD patients. It contains clear, step-by-step procedures for exposure and ritual prevention that are fundamental parts of what we know to be the most powerful treatment for OCD. In addition, I was pleased to find step-by-step procedures and examples of how to use cutting-edge cognitive techniques. The book offers clear suggestions for working with a variety of forms of OCD, including scrupulosity, hit and run, and hoarding problems. This book should be helpful to people who need to do self-directed treatment as well as to therapists who can use the examples and steps to treat OCD effectively." Bruce M. Hyman, PhD, LCSW, is a cognitive behavioral therapist in private practice in Hollywood, FL, and has been the director of the OCD Resource Center of Florida (www.ocdhope.com) since 1991. He specializes in the cognitive behavioral treatment of adults and children with OCD, OCD spectrum disorders, and anxiety disorders, and is coauthor of Coping with OCD. Cherry Pedrick, RN, is a registered nurse and freelance writer in the greater Seattle, WA, area. She is coauthor of Loving Someone with OCD, Helping Your Child with OCD, The Habit Change Workbook, The BDD Workbook, Obsessive-Compulsive Disorder, and Anxiety Disorders.